One of our favourite games to come out of New Zealand is Mini Metro; a minimalist masterpiece that takes the idea of building a rail network, and filters it down into a gorgeous arcade-like simulation, where you need to try and get as many passengers around as possible before your rail network before it gets overloaded and the crowds become unbearable - Sydney, basically. It's a game that we loved on PC, and love even more on mobile, and so, this week we decided to have a chat with Peter Curry from Dinosaur Polo Club, the developer of the game. We can't wait to see what is next from this highly talented and creative team. Related reading: Matt's review of Mini Metro on PC. Related reading: Mini Metro's iPad release scooped up Best A/NZ and Best Mobile game at last year's DDNet awards. 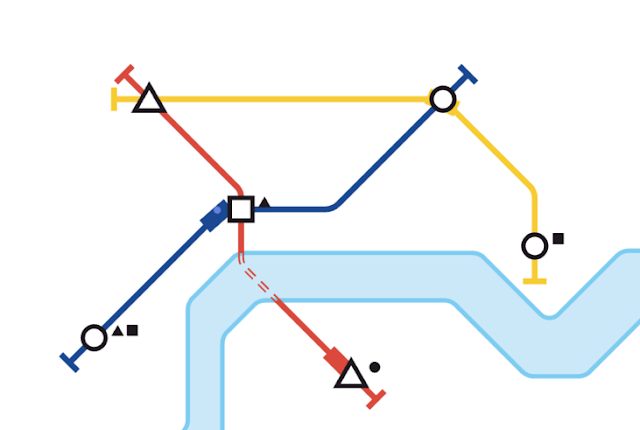 Peter C:At Dinosaur Polo Club, I'm most the way through an AI revamp for Mini Metro's passengers and trains. It's a horrendously complicated system, far and away the most complex thing in Mini Metro, and the cause of most of the feedback we get. It's the one part of the subway network that we don't let players control, so if trains pick up the wrong passengers then they're understandably upset. That's going well and it's been fun to work on, but the more I work on it the more I realise it'll never be perfect. We've got a laundry list of other bug fixes and compatibility issues that I've slowly been working through. It's nice to get all these little things tidied up, but also horrifying that I'm still working on the same little game we began over four years ago! Both Robert and Navi are overseas at the moment, which means I'm also having to do my best on customer support and all the business malarkey that crops up. So it's been a lot of emails, watching Twitter and Facebook, seeing if anyone's having problems on Steam, etc., as well as work through the ongoing discussions we're having with potential partners. All the stuff that I had no idea was involved with being an indie developer! At Play by Play (New Zealand's international game's show) we're in the process of bringing on organisational volunteers for next year's event, which we're super excited about. Lucy, Robert, and I have been getting busier and busier as the years go by, and we can't keep running the event like we did in 2016 and 2017 if we want it to be sustainable. Moshe R: What do you think about the state of the New Zealand game development industry at the moment? Peter C: The industry in NZ is doing okay. I'd give us a B. The community has really connected over the last three or four years, which has been great to be a part of—before the meet-ups sprang up, before NZGDC burst back to life, I don't think anyone knew how many of us there were. It's great that everyone's talking and sharing and there's a community around if you want to be part of it. I worry about how the local industry will grow from here. NZ is home to a handful of successful studios and financially-independent indies, but where will the next ones come from? We don't have a clear pathway for students and amateurs to develop and release successful games, and we don't have the investors to enable studios to start without internal funding. I don't think this problem is specific to New Zealand, but because of our number-eight-wire do-it-yourself mentality it causes us more problems. We're not natural businesspeople. Peter C: Normally I couldn't answer this, like most devs I don't have a lot of time to play games and those I do play are generally ancient. I only just got through the Mass Effect trilogy earlier a few months ago. But you're in luck, for some reason I picked up Hellblade: Senua's Sacrifice (I think I heard it was short? Make more short games!) and finished it earlier this week. I can't recommend it highly enough. Cool main character, stunning visuals, and audio like nothing else I've experienced before. The action is satisfying but not its strongest point—I liked it, but I wouldn't pick it up if that's all you're after. Ninja Theory found some interesting ways to ratchet up the tension. It took me just over seven hours to finish, and I was getting seriously stressed out towards the end because I'd primed myself for only about five. The tension just doesn't stop building. What I can't comment on is the game's depiction of psychosis. It is married with the game in some interesting ways, but I don't have the experience to say how sensitive or appropriate it is. Peter C: Something I love, that's a tricky one to narrow down. Hmm. I think what I love most is, despite how much the landscape has changed over the past few years, the barrier to entry into games is so absurdly low compared to any other industry. One or two people can hack together something, and if it's unique and engaging and looks interesting, then you'll see it up on Steam right next to the latest AAA release. Can you imagine what you'd need to do to turn an idea into a TV show or movie, and have it distributed through mainstream channels? The flip side to that is the myth of the overnight success story that leads to "build it and they will come". Most of the overnight successes were years in the making, not to mention the thousand failures and hundred break-evens! Peter C: I had to look up who/what Hatsune Miku is/was, so I don't feel remotely qualified to answer the question. You age so fast in this industry.